Floating platforms - EN - ZWM Dojnikowscy Sp. J. The first floating platform created by the ZWM was built in 2011. Since then, we have built dozens of such facilities in our country. They are highly appreciated by our customers who value sport recreation of high quality. 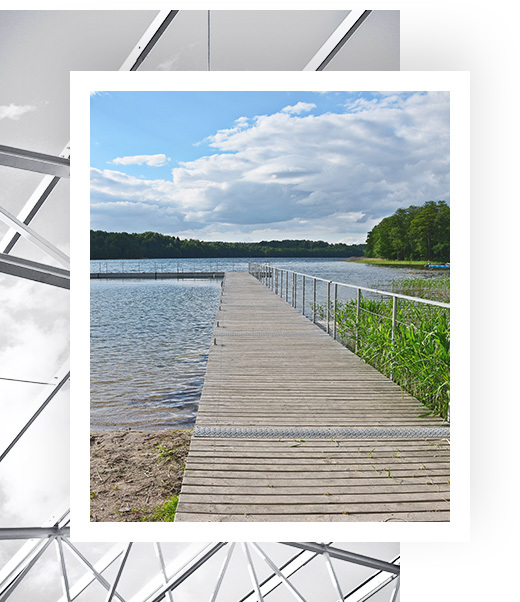 Our floating platforms will be perfect for every body of water and bathing area where no high waves are recorded. Our objects combine precision of production, great looks and newest design – all at competitive prices. We have a lot of experience in building this type of construction. We are constantly developing our skills, consistently striving for the realization of our ideas. As a result, we can still surprise our customers; and with each new project, we can guarantee high quality of our facilities and full satisfaction from using them. For the production we use solid wood, which is famous for its strength and visual qualities. Keeping high standards in the process of floating platforms production is also worth noticing. Equally important is that we meet the necessary constructional requirements, confirmed by the Polish Register of Shipping. ZWM floating platforms are certified by the Polish Ship Register. Stability and displacement are confirmed by the Certificate of Product Recognition.